Senator Godswill Akpabio shaking a service chief at the event. 'The presence of the service chiefs at such a political gathering showed that Buhari as the commander-in-chief had compromised the heads of the military agencies." Pictures of service chiefs attending President Muhammadu Buhari’s campaign rally tagged ‘Next Level’ have become a source of worry for the Atiku Abubakar Campaign Organisation, a spokesman for the organisation has said. Some service chiefs including the Chief of Defence Staff, Gen. Gabriel Olonisakin; the Chief of Air Staff, Air Marshal Abubakar Sadiq; and Chief of the Naval Staff, Vice Admiral Ibok-Ete Ibas were seen attending the event. However, it could not be immediately ascertained if the Chief of Army Staff, Lt. Gen Tukur Buratai, also attended the event which took place in Abuja on Sunday, November 18th. 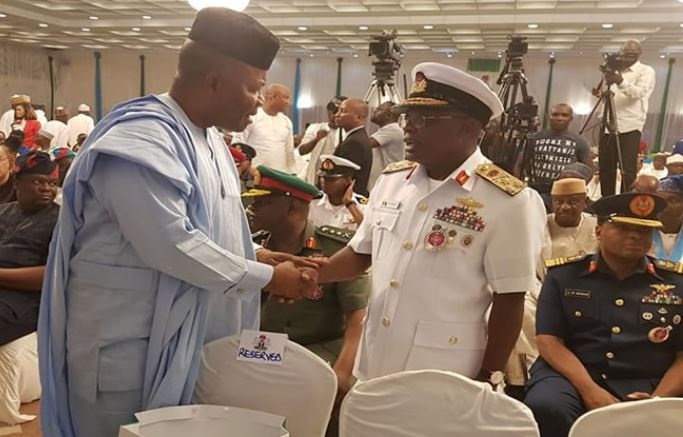 In one of the photos, the Chief of Naval Staff is seen shaking hands with All Progressives Congress chieftain and former Governor of Akwa Ibom State, Senator Godswill Akpabio. The event was well attended by the APC Chairman, members of the APC National Working Committee, members of Buhari’s campaign team as well as several ministers who took to the podium to bash the Peoples Democratic Party amid chants of ‘APC, Next Level’ from the audience. The Spokesman for the Atiku Abubakar Campaign Organisation, Segun Sowunmi, said the presence of the service chiefs at such a political gathering showed that Buhari as the commander-in-chief had compromised the heads of the military agencies. Sowunmi called on the international community to take note of the development as it could imply that the military had already started working for Buhari’s re-election.